Content marketing: Should solopreneurs guest post? Unfortunately, there are plenty of people who are willing to take advantage of people in the early stages of marketing their business. They know people in that situation are eager for exposure, and they’ll capitalize on that to get free content. And I get it — I’ve been receiving an increasing number of inquiries from people interested in guest blogging on my site. I’ve turned them down because I’m fanatical about maintaining the voice of my brand. Otherwise, it would be awfully tempting to say “yes” just to scratch “write a blog post” off my to-do list. So the key criterion for guest blogging is that it should be beneficial for everybody, not just the site that publishes your content. 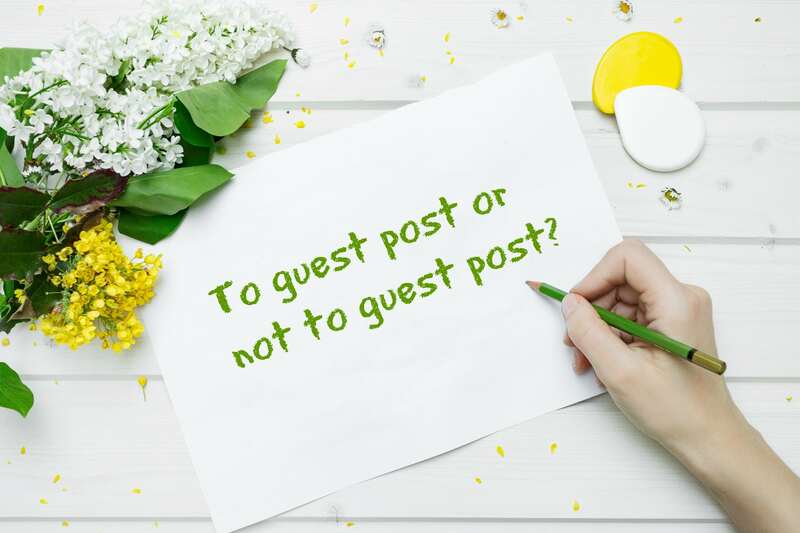 With that in mind, here are some questions to help you decide whether an opportunity to write a guest post is worth your time. Unless you’re a professional writer, getting paid for a guest post probably isn’t your primary goal. It can, however, reassure you that you’re working with a legitimate site (plus, extra cash never hurts). The following list was created primarily for freelance writers, but many industries — especially tech and IT — are always looking for contributors with niche experience. So take a look through the list linked below, and see of there are any sites looking for posts on whatever it is you do. If so, send them a pitch! Less interested in being paid for your guest post than in the other benefits? Here’s a list of markets that don’t pay but do accept guest posts. Is it a high-quality site? One of the main reasons people write guest posts is to gain access to the host site’s traffic. But that only makes sense if the host site gets considerably more traffic than you do. If so, you’ll get your content and your business in front of far many more eyeballs than you would on your own blog. And, if you write quality content that offers value to the host site’s audience, some of those readers will visit your blog to learn more about you. This article by guru Neil Patel highlights some impressive success stories. Even if the host site’s readers don’t go to your site, all those views lay the groundwork for your name recognition and thought leadership. On the other hand, if the host site has less traffic than yours, they may be trying to get free content or use your audience to boost their views. And there’s nothing wrong with giving a fellow business owner a helping hand; just realize that you’re unlikely to gain anything but good karma from the arrangement. What’s the site’s authority ranking? Domain and page authority, developed by Moz, are scores that predict how a domain or page will rank on search engine results pages (SERPs). Scores range from one (where new sites/pages always start) to 100, with 100 being the best. The algorithms used to determine scores are complex (and way over my head), but all you really need to know is that guest posting on a site whose authority is higher than yours will benefit you a lot more than posting on a site with lower authority. Social authority refers to how engaged a site’s readers are and is based on things like comments, shares, and likes. Writing a guest post for a site with a higher social authority than yours will benefit you more than writing for a site with low social authority. Will they promote your content? You can check a site’s Twitter stream and other social platforms to see how well they promote content written by guest bloggers. How do they handle links and CTAs? Let me get one thing out of the way right now: Don’t even consider guest blogging for a site that won’t include links back to your site. Just move on. Where will the link be? A lot of sites offer author bios, and, while those may be flattering, a link in a bio (or footer) transfers far less authority than a link within the content of your post. There’s nothing wrong with a bio, but give priority to sites that will let you include relevant links to your site within the text itself. Will they allow you to include a CTA? Some sites allow you to include a promotional call to action at the end of your post, and some don’t. Give preference to sites that allow you to include a CTA (just don’t be spammy). Will the links be “follow” or “no follow”? “Follow”/”no follow” designations tell Google whether to count a particular link when they calculate page ranking, SERP, etc. The “no follow” designation was intended to keep spam from taking over the internet, but some sites use it for links within guest posts. For the most part, while any link can give you a boost in awareness, a guest post that includes only “no follow” links really isn’t worth your time and effort. Should solopreneurs guest post? Well, that’s up to you and what you’re trying to accomplish. Unless you’re being paid to contribute a post, the benefits come in terms of traffic, authority, promotion, backlinks, etc. A guest post on the most trusted site in your niche could be the boost that launches you into the big leagues; a guest post on a site no one has ever heard of (probably) won’t hurt you (unless it’s obviously spammy and of low quality), but it won’t help you that much, either. Great advice! Thanks a lot for this post.